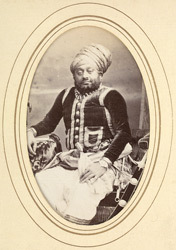 DHRANGADHRA: Man Singh, Raja of Dhrangadhra (1837-1900). bl.uk > Online Gallery Home	> Online exhibitions	> Asia, Pacific and Africa Collections	> DHRANGADHRA: Man Singh, Raja of Dhrangadhra (1837-1900). Three-quarter length seated carte de visite portrait of Man Singh, Raja of Dhrangadhra (1837-1900) from the 'Album of cartes de visite portraits of Indian rulers and notables' by Bourne and Shepherd, early 1870s. The chiefs of Dhrangadhra in Kathiawar, Gujarat, were from the ancient clan of Jhala Rajputs, who were said to have entered Kathiawar from Sind in the 8th century. The chiefs bore the title of Raj Sahib, with the predicate of His Highness. Raj Sahib Sir Mansinghji Ranmalsinghji (1837-1900), who succeeded his father in 1869, was distinguished for his enlightened administration, especially in the matter of establishing schools and internal communications. He was created a Knight Commander of the Star of India in 1877. He died in 1900, and was succeeded by his grandson Ajitsinghji Jaswatsinghji (b. 1872).